North Carolina Democrats seem poised to make education the centerpiece of the 2016 campaign. And why not? This is a really smart, pithy article from Thomas Mills’ blog about North Carolina Politics. Last week at the Canadian Congress of Social Sciences and Humanities held in Victoria, BC I received the Alan Thomas Award for Graduate Student Research for this paper, which I presented there. It’s a feminist historiography of Adult Education in Canada– specifically Isabel Wilson’s role in the production of Citizen’s Forum, an early experiment in mass media produced by the Canadian Broadcasting Corporation and the Canadian Association for Adult Education. 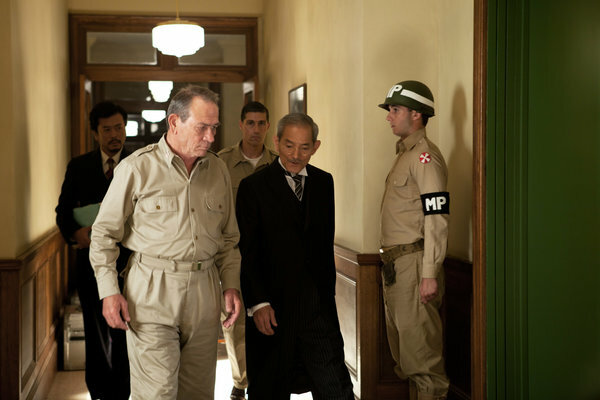 ‘Emperor,’ starring Tommy Lee Jones as Gen. Douglas MacArthur – NYTimes.com. This film, like last year’s Lincoln seems to have less to do with an accurate depiction of historical events than it does with molding the American public’s view present-day politics. In this case the filmmakers take on the question of how the US military metes out global justice. Of course, the parallels between figures like Hirohito and Bin Laden or Obama and MacArthur are less important than the larger image of the US military as a force for global justice. This is especially true in this type of mainstream fictionalized film genre where facts are obscured in favor of presenting a shiny narrative surface about international justice being done. As one commenter points out on this NYTimes review page, no such investigation into the liability of the Emperor for the attack on Pearl Harbor took place. This is a fantasy built up around the 21st century mainstream view of the American military as a force for bringing the terrorists responsible for the World Trade Center bombings to justice. The present-day reality of US military intervention in places like Afghanistan, Pakistan and North Africa is MUCH more complicated and messier. This film sits dangerously astride the boundary between escapist historically revisionist war-thriller and out and out propaganda for the United States Military’s present day role as a police force in Asia. It would be interesting to look back at all the major Hollywood films which have come out since 2001 which use Japan as a proxy setting for US military war-on-terror propaganda. On the heels of the US invasion of Iraq. Tom Cruise portrayed an American military captain sent to Japan to train the Japanese military against his will. This film has some interesting back-story alluding to the United States own Imperialist project on the North American continent. Just as it was the European settlers’ manifest destiny to control all Native American territory from sea to shining sea, the Iraqis would surely greet the US invaders as liberators, and likewise, Tom Cruise could infiltrate those few remaining Japanese isolationists. Memoirs of a Geisha might fit into this list as well. But it’s not as overtly a war story… perhaps more of a cultural war. Perhaps this didn’t make it into the film version, but there is definitely a US military presence in Golden’s book. Clint Eastwood’s Letters from Iwo Jima may complicate matters even further. I actually should watch this one before I make a judgement. Apparently the screenplay was written by a woman of Japanese ancestry. I suppose it’s possible that this film may actually break the pattern of Japan as a proxy location for films on the War on Terror. Of course, by 2006, Hollywood was already beginning to process the history of the War on Terror more literally with films like Flight 93 and World Trade Center. The last title that I can think of off hand was not a Hollywood film, but a TV mini-series– The Pacific. But it was produced by Steven Spielberg’s DreamworksSKG. So, it’s close. So, I realize I’m lacking in close analysis of these films I list off here. Maybe it’s obvious to say that these films about war released during war time will necessarily reflect attitudes, not only about the historical wars depicted in fictionalized form, but also attitudes about the present war. But I think there is something significant about the use of Japan as the symbolic place-holder for Hollywood’s engagement with the War On Terror, particularly in years when films like Jar Head came under fire for realistic depiction of the war in progress. (Cries of “Too soon! Too soon!”– in fact this meme arose during the post-9/11 period, I think precisely in response to depictions of violence deemed inappropriate in ad hoc heckler fashion by audience members, who were either too squeamish or otherwise not yet ready to have the wound of their ideological attachment to the official 9/11 story of heroism/patriotism prodded by comedians or other entertainers). I’m looking forward to taking a closer look at Emperor to see thematically if it’s more similar to Three Kings or Zero Dark Thirty. A micro-review I wrote for one of my History Classes this term, which I am particularly proud of. Dewey’s account of experience contributes an additional twist. Like Peirce, he thought that experience was ‘full of inference’. Experience is a process through which we interact with our surroundings, obtaining information that helps us to meet our needs. What we experience is shaped by our habits of expectation and there is no basis for extracting from this complex process the kind of ‘thin given’ beloved of sense datum theorists. We experience all sorts of objects, events and processes, and we should not follow philosophers who seek to impose a distinction between the thin uninterpreted data of experience and the inferential processes which lead us to interpret what we experience as books, people and so on. The dichotomy between the passive given of experience and the rich results of our active conceptualization is not supported by our experience. It is yet another of the philosophers’ distortions. Here is a link to the original Becker publication. This is an important document of a thinker ahead of his time. He apparently wrote a history of the founding of Cornell, which took the form of a series of lectures and which might be an interesting context for my Black Mountain project. Becker Western Pol. Quart. 1955.